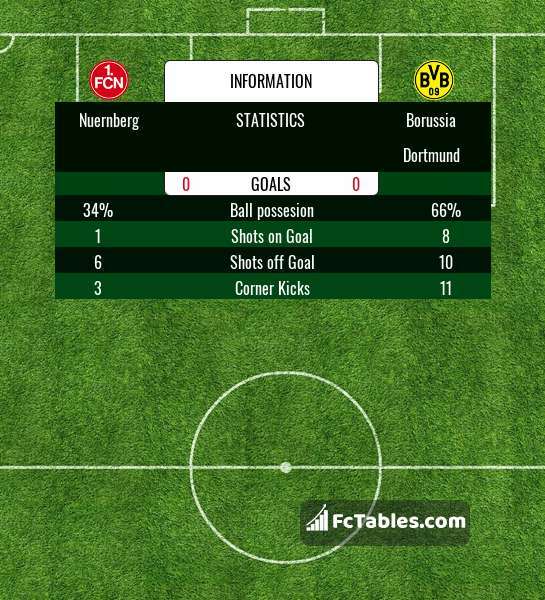 Match Nuernberg-Borussia Dortmund 1. Bundesliga the fixture is set to kick-off today 19:30 on Max-Morlock-Stadion. Refereee Harm Osmers. Team Nuernberg is in the releagtion zone of the table. 18 position. In 5 last matches (league + cup) team gain 1 points. From 15 matches can't win a match. The best players Nuernberg in 1. Bundesliga, who scored the most goals for the club: Hanno Behrens 3 goals, Mikael Ishak 3 goals, Adam Zrelak 2 goals. Players with the most assists: Hanno Behrens 1 assists, Mikael Ishak 1 assists, Adam Zrelak 1 assists. Injured players Nuernberg: Dennis Lippert. Simon Rhein. They will not be able to play in the game due to suspension. Team Borussia Dortmund is at the top place in the table (1 place). Last 5 games (league + cup) finished balance 11 points. Borussia Dortmund did not win the match from 2 games. Borussia Dortmund has not been defeated from 5 matches. The most goals in 1. Bundesliga for Borussia Dortmund scored: Marco Reus 13 goals, Francisco Alcacer 12 goals, Jadon Sancho 7 goals. Most goals developed: Marco Reus 6 assists, Jadon Sancho 9 assists. Direct matches: usually ended with winning of Borussia Dortmund. 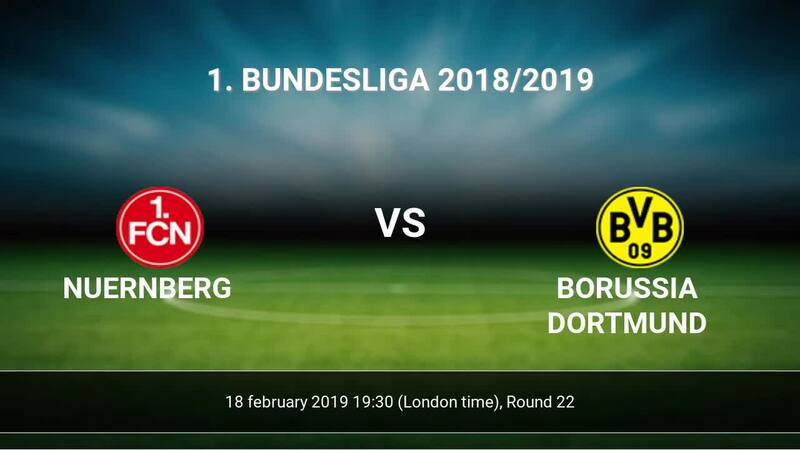 Balace of both teams games are: 2 won Nuernberg, 14 wins Borussia Dortmund, 8 draws. In 13 matches the sum of the goals both teams was greater than 2.5 (Over 2.5). On the other hand, 22 matches teams scored more than 1.5 goals (Over 1.5). In 12 matches the both teams have shot at least one goal.